This is the ultimate comfort food. It’s crunchy, cheesy, chicken-y, buttery…just overall delicious. This is another recipe that has been handed down from my mom. She used to make it for me all the time when I was little. Zack really likes it, too, so it has become a staple in our household. This is my first post in a few days. I’ve been really busy getting everything ready for Thanksgiving. I made desserts to take to my granny’s dinner on Thanksgiving day. Now I am preparing for my first ever hosting of a Thanksgiving Dinner. My parents, stepdad, Zack’s parents, brothers, and grandma are all coming. I am really excited and really nervous at the same time. (Yep, I’m cooking the entire traditional spread myself). The dinner is Sunday, so be expecting a post about it soon after that. Place chicken in a medium casserole dish. Mix soup and mayonnaise and spread over chicken. Sprinkle with cheese. Melt butter and combine with crushed crackers. Place on top of cheese. Bake at 350 degrees for 30 minutes. I suspect this tastes like chicken. I love casserole. I don’t eat chicken but I can still use this recipe! Thanks for sharing! Cool, let me know how you tweaked it. I may have to try your version, too! Thanks. This sounds so wonderful… and comforting. 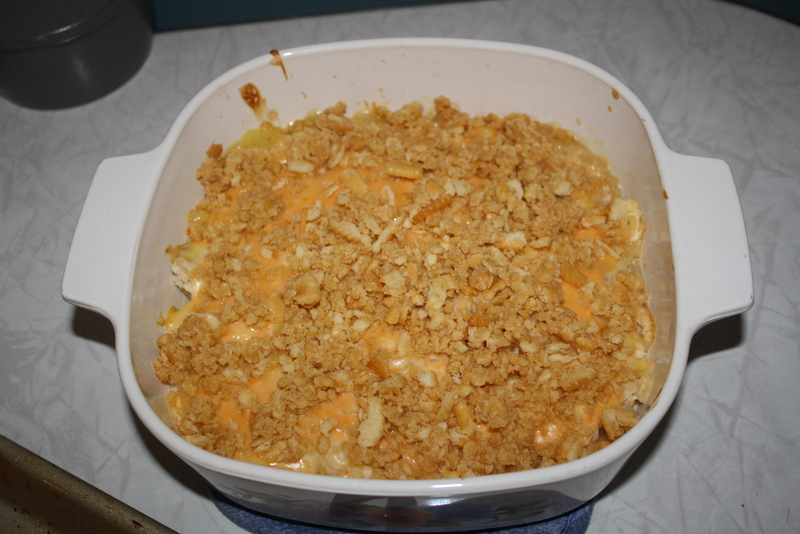 I love casseroles like this!